Peterborough Phantoms continued their winning streak with a smooth away success last night (October 29). The city men 5-1 triumph at Gillingham-based Invicta which stretched their perfect start to the NIHL Division One South to nine games. Slava Koulikov’s men have now won 11 successive matches in all competitions. Ales Padelek scored twice for Phantoms in Gillingham. Table-topping Phantoms are also the highest scorers in the division. They have found the twine 57 times in their league outings and boast arguably the meanest defence having conceded only 13 goals. Basingstoke have shipped one fewer, but have played two less matches. Phantoms had to kill a couple of penalties before they hit the front through a powerplay goal from Ales Padelek last night. That was the only breakthrough of the opening session but the visitors’ lead doubled early in the middle stanza when Glenn Billing struck. A quickfire brace from Owen Griffiths followed as he lit the lamp twice in less than two minutes – the first of them a short-handed effort and the second an unassisted strike. Former Phantoms man Mason Webster grabbed a consolation for the hosts when netting on a powerplay in the third period, but Padelek had the final say when completing the scoring with 61 seconds to go. 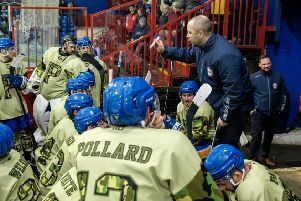 Koulikov said: “It goes down as a very good road win against a tough Invicta team. Phantoms face two league clashes this weekend. They entertain London Racers at Planet Ice on Saturday (November 4, 7pm) before heading to Swindon the following day (November 5, 6.15pm).